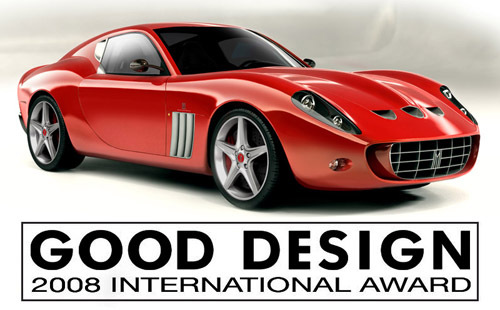 The Vandenbrink GTO - a very limited coachbuilt Ferrari 599 GTB - has been awarded the GOOD DESIGN AWARD 2008. As far as we know, this is the first time ever a modern Special Coachbuilt car has been given such a prestigious design award. The award is given by The Chicago Athenaeum Museum of Architecture and Design and is the oldest and most prestigious Awards Program worldwide, elevating the best and finest new design and design innovation for products and graphics. Michiel van den Brink: "We are proud to receive this prestigious award, being recognized by art and industry leaders as a top-level player next to highly esteemed designers like Walter de’Silva. This is a great honour for our young design company". Founded in 1950, the Good Design Award is the world's oldest and most celebrated awards program that bestows international recognition upon designers and manufacturers for advancing new and innovative product concepts and for stretching the envelope beyond what is considered standard product and consumer design. To learn more about Vandenbrink Design and the award-winning Vandenbrink GTO, please visit www.vandenbrinkdesign.com and www.chi-athenaeum.org. Click here for the Vandenbrink GTO gallery.